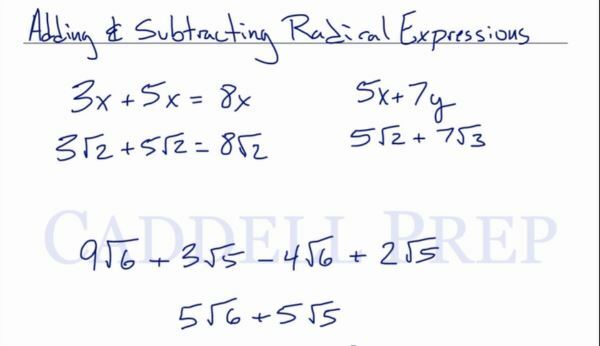 In this video, we are going to be adding and subtracting radical expressions. Adding and subtracting radical expressions. Only like terms can be added. we cannot add them together. it will just stay like this. They won’t combine since they are different radicals. This may look unlike terms so we can’t combine them. But we can simplify this first. The first expression can’t be simplified so we simplify the second expression. I chose these because is a complete square. Since they are already like terms, we can combine them now. So always make sure that they are in their simplest terms before we add them. Because maybe they can be combined, they are not just in the correct format. Let’s try this one now. Let’s simplify all these first. Now, let’s combine the like terms.